Out of the small, quiet town of Temple, Texas emerges a rock band that is about to take the world by storm. Fronted by Lacey Mosley, Flyleaf is comprised of members James Culpepper on drums, Sameer Bhattacharya and Jared Hartmann on guitar, and Pat Seals rounding out their sound on bass. Not just your average angry rockers, this fresh and innovative group cites influences such as Rage Against the Machine, Incubus, Nirvana and Foo Fighters. Flyleaf's music is probably best described by Lacey herself. "Our music is passionate and on purpose. It's angry and sad and urgent and loving. It's about our experiences and passions and how we have overcome. Our message is to encourage the hopeless people to have hope, and the apathetic people to stand up in their destinies and purposes and believe in something good and world changing." 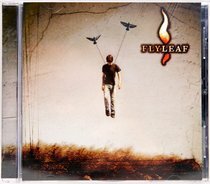 The debut album from Texas based rock outfit FLYLEAF is in one word, amazing, and sets a benchmark for other Christian bands to aim towards. Flyleaf are lead by vocalist Lacey Mosley, who provides a diverse vocal experience which is hard to find in todays music scene. The music is best summed up as hard rock with very grungy roots. What separates Flyleaf from the crowd is Mosley's powerful vocals and uncompromisingly honest lyrics. This album is a definite must have for any fans of Christian Rock and Metal, particularly fans of Fireflight, Evanescence, Day Of Fire, Korn  and Skillet.